Budget. 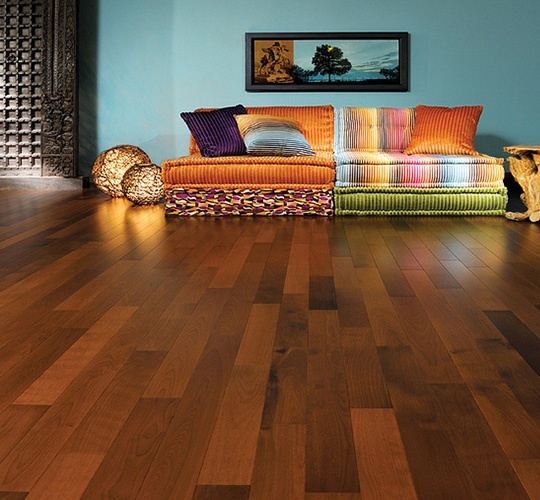 Hardwood flooring comes in many makes and models. Some are super expensive, and others are incredibly affordable. Before you set out on your renovation journey, have a budget in place, and do not budge from your initial numbers. Wood Type. The space you'll be installing your hardwood flooring may limit your options. If you're working on a room that is beneath ground level (known as "below grade"), you should avoid solid wood, as these areas are more prone to moisture, which can cause damage. Your sub-floors can also be the determinant of your optimal wood choice. Concrete. Concrete sub-floors often require engineered wood, but in today's market, you can purchase nearly any type of wood in an engineered format. You can avoid this by installing plywood over the concrete, but that adds to your costs. Plywood. This is a versatile option, which will allow you to use nails (as opposed to glue, which can be too permanent sometimes) with solid or engineered wood. Particleboard. Particle-board doesn't work well with hardwood flooring. You'll want to replace it with plywood to get the best finish. Lifestyle. Kids, pets, and parties can wreak havoc on the wrong wood type. If you have a high-traffic area, look for a hardwood that can stand up to the challenge or patterns, stains, and finishes that can hide future flaws. Red oak tends to be a happy medium, as it's pretty sturdy and fairly priced. Color. Some types of wood dictate the chosen color, but others allow you more choices. Assess your needs, and know what you are looking for before you start shopping. Feeling ambivalent about your shade will leave you frustrated during your search. Assess your home's hues, and keep on track with options that will best compliment your needs. Sub-Contracting or Do-It-Yourselfing? Any home remodeling project can easily become a huge endeavor. While you may be inclined to save some cash, and do the work yourself, keep in mind that this can be a difficult task, and if you aren't experienced and skillful, you could end up ruining your newly purchased wood. Have your own tricks to add? Feel free to add your own hardwood flooring tips below!